Growing a vegetable garden in a polytunnel extends your vegetable growing season. A polytunnel enables you to grow fruits and vegetables that are out of season or exotic to your region. They provide weather protection, a sheltered place for nurturing seedlings and can enhance your enjoyment of your home vegetable garden. A polytunnel can expand the scope of your food growing, but requires extra effort to set up and maintain. retain additional heat to facilitate plant growth. protect seedlings and young plants for transplanting and later sowing. provide a warm and lush smelling place to garden in diverse weather. The disadvantages of a growing a vegetable garden in a polytunnel are that irrigation is required and pest and disease problems can build up quickly in the enclosed space. 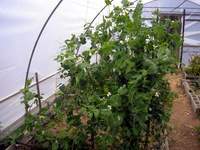 A polytunnel is basically a large framework of semi-hoops covered in polythene plastic. The polythene traps the sun’s energy creating an increase in temperature. The polythene is treated to resist UV damage. Polythene can have a thermal, anti-fog cover that prevents moisture forming into larger drops that will block sunlight or drip on the plants. Structures must be clad in fabric to prevent damage to the plastic when it rubs against the frame. 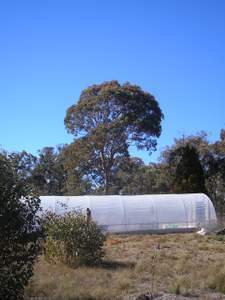 A polytunnel can also be called a plastic or polythene tunnel or greenhouse, growhouse, polyhouse or poly tunnel. Cheaper than glass greenhouses, some people think polytunnels aren’t so great looking but I think they’re gorgeous. This is probably because I’ve experienced the steady year round stream of delicious food that flows out of our own polytunnel. Others question the environmental cost of the structure against the savings resulting from growing a large amount of your own food. However, growing a vegetable garden that supplies you with fresh and organic food (without food miles) is pretty green. A polytunnel should be easy for you to access, not too remote from your house, and have an adequate water supply available. It’s best to build a polytunnel on level ground in a sunny but sheltered position. Leave yourself at least a metre around the outside of the polytunnel to make it easier to build and maintain. Good soil for direct planting. Make the most of your polytunnel space by using dwarf, miniature or climbing cultivars. Choose disease-resistant varieties. Some crop suggestions include tomatoes, capsicums, eggplants, chillis, cabbage, Asian greens, salad greens, snowpeas, potato, radish, silverbeet, carrot, cucumbers, melons, cauliflower, watercress and strawberries. The reason for growing some of the hardier vegetables in this list is to bring on an early crop or to grow them all year round. Stagger sowings so that you get a steady supply of fruit and vegetables from your polytunnel. Create vegetable beds inside your polytunnel so that you don’t have to walk on the soil to get to your plants. Raised beds will allow you to build up the soil to improve its quality. Use a thermometer that indicates the maximum and minimum temperature so that you can track the changes in your polytunnel’s climate. Ensure doors, windows and vents are open in hotter weather so that the polytunnel interior doesn’t over-heat. No matter the size of your tunnel, space is limited and you have to keep things well organised. Polytunnels should be washed inside and out annually so maximum sunlight gets in. Patch holes with repair tape before they get big. Covers should last 3-5 years before they need replacing. Some of the newer polythene sheets can last up to ten years. Use micro-irrigation such as dripping systems to conserve water, and water in the morning. Mist systems allow you to control humidity and adjust inside temperatures while you irrigate. Keep your plants as healthy as possible. This is the best defence against pests and diseases. Restrict fungus diseases by providing good ventilation and airflow. Check your fruit and vegetables regularly for pests and diseases and deal with problems as soon as possible. Use crop rotation techniques to avoid the soil getting tired, depleted of nutrients and vulnerable to diseases and pests. Don’t overcrowd your plants as this also encourages disease. Our polytunnel story is a long and ongoing one. Dubbed “Polytown” by our daughter, it’s a 4m x 12m structure down by the creek (positioned for the fertile soil, not the water.) It’s built over old worm farm beds. Polytown spent about ten years in the imagination and took three years to build. Polytunnels built from kits can be erected in a couple of days, but we built ours from scratch (including making the hoops) and two babies arrived to distract us along the way. However, it’s been well worth the effort as it continues to provide us with an abundance of vegetables despite unpredictable and harsh frosts. Our polytunnel is consistently at least 5 degrees warmer than the outside temperature. The kit includes everything you need for assembly, including steel frame, polythene cover, anchorage, ventilated doors and sides. Reviewers report that it’s very easy to set up (the manufacturers claim it will take approximately 2-4 hours.) With kits this good available we will certainly not be building our next polytunnel from scratch! We’ve had the added challenge of keeping out gastronomically experimental wildlife. Polytown is surrounded by a 2m high chicken-wire fence to keep out the wallabies and roos. This is also extended for a metre along the ground to keep out the wombats and rabbits. There’s also a metre deep trough dug with a Dingo mini digger and lined with galvanised iron to keep out eucalyptus roots. Although Polytown has taken us a while to set up, we're reaping the rewards of growing a vegetable garden in a polytunnel. Polytown is a lush, green, warm place to garden, and if we get hungry snowpeas, tomatoes and strawberries are just a pick away. Check out The Polytunnel Handbook from Green Books. It's full of top level guidance, tips and inspiration. Their polytunnel looks really well laid out - wish I'd seen this before we built ours!